She was born Marian Bolton in Preston, England, a town that had been part of the British cotton spinning and weaving industry since the beginning of the Industrial Revolution. Preston is a port town on the northwest coast of England and, although nowhere near the size of nearby Liverpool, was part of the shipping trade with the Americas. She grew up in the nearby western suburb of Penwortham, which in the post-Depression years of the late 1930s, had changed from a small village into a suburb filled with streets of semi-detached houses, the same as were being built across Britain to provide for the expanding populations of the cities. The house had the traditional back garden, but more importantly beyond the back gate there were open fields and woods for miles. When she was only 3 years old her father was sadly killed in an auto accident and from then on Marian and her younger sister, Barbara, were brought up by their mother, Mary Bolton, with the assistance of their spinster aunt, Dora Howson. Mother was a trained corsetiere who worked from home and traveled the rural neighborhood by bicycle and bus to deliver and fit her garments to the local ladies who needed extra control. Remember, this was World War II and very few people were authorized fuel to operate a car. Auntie Dora worked in a munitions factory and after the war became a pharmaceutical assistant at Boots the Chemist. Between them these two ladies provided for the needs of the two growing girls. As with most children Marian attended the nearby primary school from age 5 until 10. In those years the British education system that was provided by the government had two separate streams of secondary schooling. One was for those children who showed better intellectual skills and would prepare them for careers that required intellectual capability or further academic training. The other stream had more focus on manual techniques and practical skills. The selection process, introduced in 1944, was called “The 11-plus exam”, by which children for the intellectual stream were tested when they were 10 and, if selected, sent to Grammar Schools. This system no longer exists in most of Britain today. To help American readers with the conflicting terminology, Grammar Schools catered for ages 11 until 18, and were free and usually run by county governments. There were, and still are, equivalent private schools, which have less stringent entrance testing and could possibly accept any pupil who could pay. To add to the confusion, the more prestigious of these private schools in Britain are called Public Schools. The name has nothing at all to do with public spending. The term originates from medieval times to distinguish them from the private schools which were then only available by invitation or had restrictive affiliations, such as religious beliefs. Fortunately Marian passed the 11-plus exam and attended Balshaw's Grammar School in Leyland for 7 years, which required a half-hour ride each way on public transport every day. On finishing her schooling there, she decided her future was in school teaching and went on to Kesteven College in Lincolnshire which specialized in teacher training. The college was set in spacious parkland and the central building, Stoke Rochford Hall, was a very large mansion built in 1834 that had been converted. After 2 years in this idyllic rural setting Marian set off on her first teaching job, in one of the grimy working class areas of a major city, Nottingham. Although there was coalmining nearby - remember the novels of D.H. Lawrence - Nottingham was not a center of heavy industry. The main industries at the time were lace making, bicycles, and tobacco products, which produced a broad need for unskilled workers and Marian's students mostly came from these poorer families. Happily she loved her work and really enjoyed the children, who were in the ages 7 and 8. 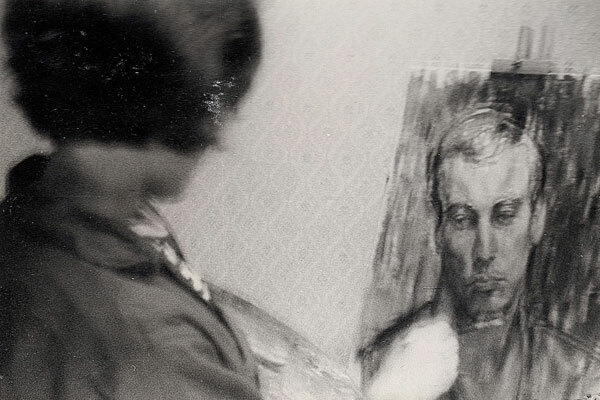 Marian's artistic skills had been recognized since her early years. In fact, even in her teens, her paintings had been selected for exhibition at the Harris Museum in Preston. However a sad story relates to her early works, which were stored in a shed at home while Marian was living out of the country. Some became damaged by water and her Aunt in a tidy up campaign chose to burn them all. Whilst living in Nottingham Marian decided to improve her artistic skills and as a consequence attended evening classes at the Nottingham College of Arts. In those days city colleges were set-up to provide part-time tertiary education, which couldn't be obtained at universities without full-time attendance. In the 1990s Britain reorganized the city college system and combined the individual colleges into central structures that became equivalent to universities, so that today the Nottingham city colleges are now part of Nottingham Trent University. It was because of her earlier relationship with the College of Art, and of course her artistic successes, that in 2012 the university awarded Marian the honorary degree of Doctor of Art. Another significant event happened while teaching in Nottingham. Marian met an undergraduate student at what was then the only university in town and married him there in 1961. She and her husband, Roger, had two children, Mary Emma (sometimes called Beth) and Benjamin Roger. Emma was born while they were in Nottingham but Ben was born on the other side of the world in Australia, to where they emigrated in 1962. With one child she was still able to do some teaching, but once Ben arrived she was obliged to stay at home. This restriction was however to be the catalyst that would start her on the road to her eventual artistic success and fame. Marian had recalled a class she'd attended in college which provided an elementary introduction to textile dyeing as a classroom tool. Although she was still painting when she had time, she thought that it would be fun to play with dyes in her kitchen while she was tied to the home with children. 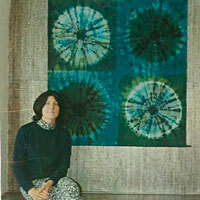 So she bought a copy of Tie and Dye as a Present Day Craft (1964) by British author Anne Maile and taught herself textile dyeing. People became interested in what she was creating, friends at first and then galleries and retailers. She made a variety of things - scarves, cushions, drapes, as well as wall art. Her skills expanded quickly to a level that in 1966 caused her to be invited by the El Dorado Gallery in Sydney to have a one person show of her wall hangings. And now Marian's career in textile dyeing was underway.